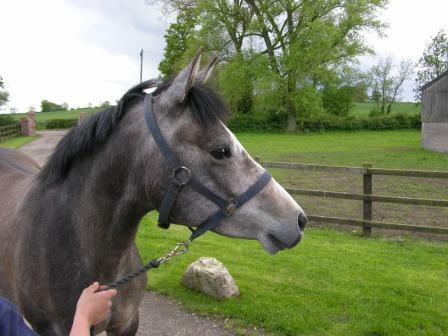 Part Bred Arab, 14.2hh, born 2004. Twiggy is a Part Bred Arab by Shamil. She is standing about 14.2hh at the minute and is a super moving pony bred by Tina Bennett of Aklah Arabians. 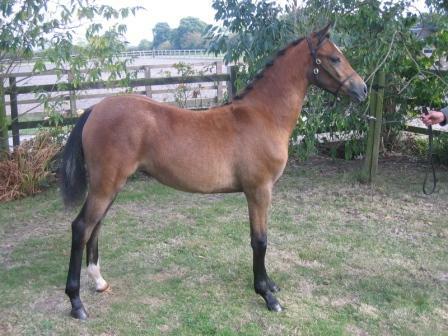 Tina showed her as a yearling and she gained a reserve champion part bred arab at a Arab Group Show. We presented her at the SPSS grading and show in October 2006 and she has now graded with a score of 73.5% into the preliminary stud book, due to incomplete breeding, of the SPSS and gained a 2nd Premium at the show. She has produced a lovely filly foal 2007 by our own stallion Thistledown Copper Lustre - "Harry" and we have called her "Bridget". We were so pleased with her we have covered her again with Harry for 2008, unfortunately December 2007 we were saddened with the loss of this lovely mare. Bridget, her only foal, is left to live up to her mum's superb temperament and follow on to give her mum something to be very proud of. Bridget has already proved to be successful in the show ring, gaining a First Premium, and Reserve Pony Foal at the B.E.F. Futurity Scheme, held at Arena UK also gaining Twiggy a Broodmare Diploma Award for her foal. She has also gained good results at her first two foal shows, we look forward to presenting her at the 2008 Yearling Classes. Twiggy had a filly foal Thursday 19th April in the afternoon - just to be a helpful mummy!!!! Both mum and foal are fine and I will update with more pics very shortly!!! Shamil is an elegant, handsome stallion with fine movements. As a foal he was awarded the Reserve Champion sash at the International "B" Show in Kreuth, Germany. 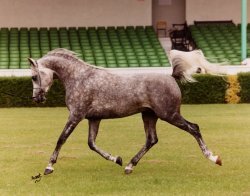 His sire SHIR KHAN, was champion at the international "B" Shows in Ostende, Belgium, Reserve Champion in Menton, France and achieved wins and high placings at the All Nations Cup in Aachen an at the World Championships in Paris. SHIR KAHN is by the famous World, European and National Champion KUBINEC. SHIR KHAN is a full brother to the supreme stallion DAVIDOFF (International Champion Stallion, exceptional riding horse) and TIBET (outstanding dressage stallion). SHAMIL's dam is the excellent Spanish mare KAR HACINA, a daughter of the exceptional sire EL PERFECTO, she gained Championship honours at the shows Moos, Germany and Marbach, Germany, won her class at the European Championships, and achieved a third place at the All Nations Cup in Aachen, Germany. KAR HACINA is the image of her dam, the Nations Cup reserve and international mare GUAL HASSIKA, one of the most beautiful mares ever to leave Spain. With the blood of generations of champions in his veins, SHAMIL is predestined for a great career as a show horse and breeding stallion.